Major HMDA Changes are just a year away! Are you ready? Although the January 1, 2018, effective date still seems like a ways off, the fact is your implementation plan should already be in motion. 2018 HMDA will look nothing like HMDA today. 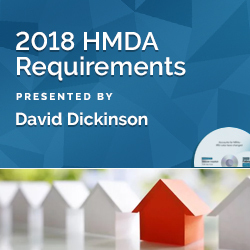 There are new criteria to determine if you are subject to HMDA. In some cases, the definition of dwelling has changed. There are significantly more data fields and even more have been modified or changed in some way. Everything you do with that data will be different from what you're doing today. It will go into a new file format with all new instructions, be filed with a different agency (the CFPB) and be filed in a completely new way. Reportable "loans" vs. reportable "lines"
It's your data, now what? This webinar is designed for loan officers, loan processors, compliance, audit, & other loan operations personnel. About the Speaker: David Dickinson is a highly trained expert in compliance regulations. He is also a motivational speaker and innovative educator. As a qualified speaker on compliance issues, David speaks for the American Bankers Association's National Compliance School, as well as, several State Banking Associations. He conducts various seminars throughout the year, has developed numerous compliance manuals and has written articles for prestigious banking publications. In 1993, he established the firm of Banker's Compliance Consulting. This program was recorded in its entirety in February 2017. The CD-ROM includes program slides, materials (if available) and follow-up Q & A document.